As part of our preview season for Ixalan, we are going to take a deeper look at some of the cards previewed on our own homepage. Today, we'll be peering behind the scenes of the process that went into creating the art of Rampaging Ferocidon, which was previewed in Melissa DeTora's article today. If you're interested in the design efforts that went into the card, Melissa has offered a very thorough look at the process that goes into designing this and similar "hate bears," so be sure to give her article a read! Action: Show a Dinosaur similar to a velociraptor or deinonychus. It stands on the body of a fallen triceratops, which is about twice its size. The raptor is reared up on its back legs in triumph. Mood: Behold the mighty predator! The key to this art is the manner in which the Dinosaur's ferocity is highlighted. If one were to hear the name of this creature in a vacuum, they would likely envision a massive incarnation of primal bloodthirst, but this creature is meant to represent something perhaps even more terrifying: a small, nimble predator full of unrelenting savagery. 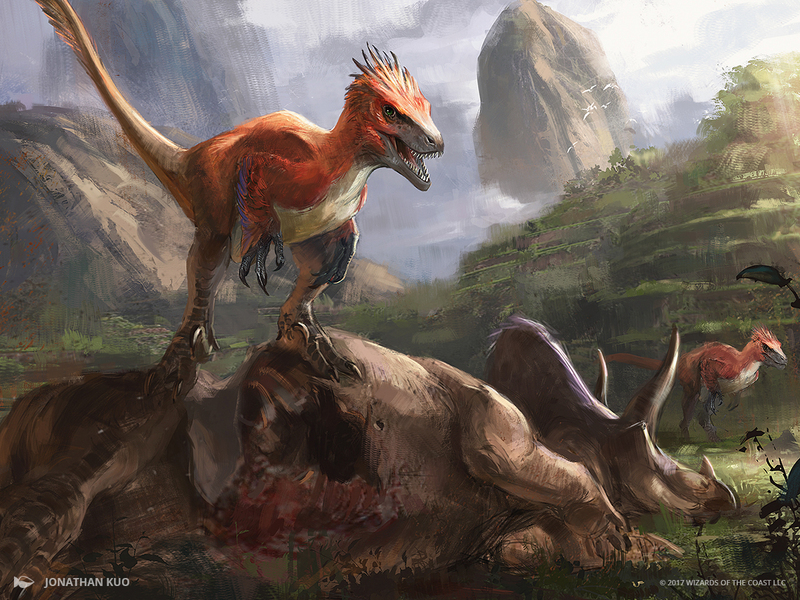 This is captured in the art by both the stark contrast in size between the predator and its prey and the shocking amount of carnage inflicted on the fallen triceratops. The message is clear: don't mess with a Ferocidon if you want your insides to stay in place.